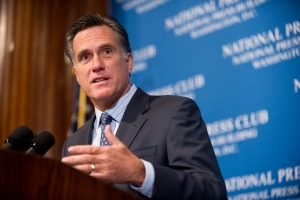 Mitt Romney, former Governor of Massachusetts, addresses a luncheon at The National Press Club. 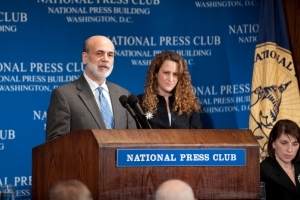 Ben S. Bernanke, the Chairman of the Federal Reserve, spoke at a National Press Club luncheon on Feb. 18 to discuss the current economic conditions. 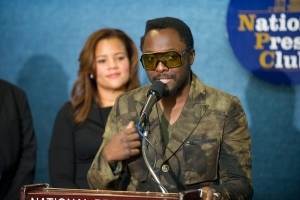 Artist Will.i.am addresses the media about green initiatives in the Club's Margaret Burke-White Room. 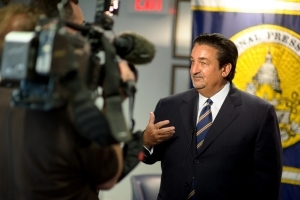 Speakers come to the National Press Club to participate in thousands of events over the course of a year. About 250 or so of these events are actually sponsored by the Club – the speakers are actually invited by the Club to participate in one of our three programs designed to create opportunities for our members and the entire press corps to question key newsmakers on the record. These events have created our global reputation as a great venue where news is made. The Luncheon speaker series allows a guest such as a head of state, politician, cabinet secretary, business leader, musician, actor, sports star or other interesting person to give a significant speech of good duration and then take questions from the press. The questions are written on cards and passed up to the President of the Press Club, who decides which ones will be asked and in what order. The entire program is one hour. All these Luncheons are covered by C-SPAN and aired several times. Some are aired live by C-SPAN or some of the other news organizations that cover these events regularly including CNN, MSNBC, Fox, CNBC, Bloomberg and many others. The NPC shoots video of each luncheon which is webcast live on our homepage and available in our archives. We also shoot and post still photos, record digital audio that our members turn into a radio program and create transcripts of the remarks. We write brief articles for our online newsletter The Wire. The Club invites a dozen or so journalists to sit at the head table, have lunch with the guest and ask questions. Some of the head table journalists write stories for their own outlets including: AP, Reuters, Bloomberg, USA Today, Washington Post and others. There are about 75 luncheons a year. Most of these Luncheons take place in the NPC Ballroom which seats about 300 or so guests. The public can buy tickets to most NPC luncheons. Sometimes the Speakers Committee – which arranges the luncheons – decides to hold their event as a breakfast or a news conference with no meal to accommodate the schedule of a guest, but this is rare. If you have never attended an NPC luncheon, but have seen them on C-Span please join us and bring a friend for an unforgettable experience. The lunch normally begins at 12:30; the speech begins at 1 p.m.; the Q & A ends at 2pm. Tickets are $35. Club members and their guests pay a reduced rate. There are about 50-75 Newsmakers per year. These events can take place in any of the Press Club rooms. While most start at 9 or 10 a.m., they can take place at any time of the day. The Newsmakers are organized by the Club's Newsmaker Committee. You may pitch the Committee to consider your topic or guest for a program. Click here to suggest a speaker. Book and author events are organized by the NPC Book & Author Committee. 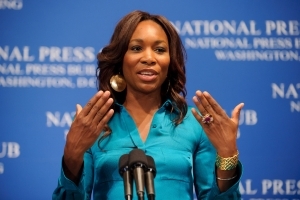 Book and author events are fundraisers for the Eric Friedheim National Journalism Library at the National Press Club. The programs are typically one hour long and consist of an introduction, author remarks, question and answer session, and book signing. There is an average of one book and author event per month. Most of the events are in the evening and can take place in any room in the Club. The Club provides books for sale and signature by the author through an agreement with Politics & Prose. There is generally a modest admission charge to the general public to reserve a seat. The events are open to working press for coverage. This is the main program at the Club for authors who are on tour with a recently published book. More information about book and author events can be found here. It is of course not only possible but highly encouraged that in addition to participating in the programs above groups hold their own luncheons, news conferences and   book events at the Club and pay the fees which are standard for the Washington market. The public must understand that the National Press Club has no opinion about the point of view of the celebrity, leader or author who is invited to speak on one of our programs – we are simply trying to facilitate news coverage by inviting them as our guests and we are also trying to get them to make statements on the record which is valuable in particular for government officials as well as the news media who cover them. So too, the Club does not endorse the policies or politics of any of the guests for private events held here. While we hope all our guests attract news coverage if that is what they wish, we do not guarantee there will be coverage and it is always up to the guest to work to generate maximum coverage of their event.